Sydney Northern Beaches powerhouse Newport have won the NSW Surf Life Saving Open Championships over fierce rivals Manly for a second straight year on the back of some sensational performances on Finals Sunday. It was the Mitchell Trim show with the Newport athlete managing to snag four gold medals in the space of two hours taking out the Open Lifesaver Relay, Single Ski, Double Ski and Mixed Ski events. “There are so many good paddlers right now – Pete’s (Scott) been to the Olympics and is very experienced. Lachlan (Tame from Avoca Beach) is just one of many good ones and there is a heap of competition,” Trim said after his Single Ski Race. Max Brooks and younger brother Charlie also had a successful time in the water claiming gold in the Open Board and U17s Board respectively. “It was a really hot field with a lot of very good paddlers. I made a mess of the start so I was actually quite far behind,” Max said. “I saw Charlie’s race and I drew a bit of inspiration from it. He performed really well, which was great to see. I saw him get a good wave on the ride in, and I hoped I would be able to get the same. Veteran Queenscliff competitor Christopher Allum wound back the clock in the Open Surf Race to claim gold over a fast-finishing Wallace Eggleton (Bronte) and Jay Furniss (Manly). “I got very lucky as I aimed higher up the beach and just managed to jag it at the end. But I’ll take it! It’s my first state title for a couple of years and I’ve got nine of them now, and they’re all very special,” he said. In the Ironman events Warilla-Barrack Point’s Matthew Sperring won the U15s after he also took gold in the swim, while Luke Chaffer (Cudgen Headland) claimed the U17s title. “It was a very tough race with the wind and choppy conditions really testing the field. The swim was definitely my weakest leg so I knew I was really going to have to work hard to keep in touch with the top. I just took a couple of deep breaths and really went for it on the board, and fortunately it paid off for me,” Chaffer said. There was more joy for the Central Coast Branch in the U19 Ironman when Brad McCloghry (Avoca Beach) was first past the post. But the biggest cheer was reserved for 34-year-old Nathan Smith of Manly who downed Kendrick Louis (Newport) and Jack Moyes (Terrigal) in a hotly contested Open Ironman Race. In the women’s field Newport’s Georgia Miller displayed class taking out both the U19 and Open Ironwoman titles on the way to eleven gold medals for the competition. Lily Costello (Redhead) won the U17 Race, while Manly’s Naomi Scott powered to victory in the U15s. The ClubsNSW Arena was called into action for the last time these championships when it hosted the Beach Flags event. Collaroy claimed bragging rights in the open division with Dean Scarf and Katie Williams both diving to gold. After over a decade’s absence from the State Championships, Katie’s brother Nick won the silver medal in the open division behind good friend and club mate Scarf. Narooma’s Lily Bennett and Lawson Christiansen (Caves Beach) won gold in the U15s with Christiansen’s victory sealing the sprint/flag double. Ngaire Hadfield (Cronulla) and club-mate Charlie Gluskie took gold in the U17s just ahead of Kate Lewis (Helensburgh-Stanwell Park) and Jedd Mitchell (Coffs Harbour). Victory in the U19 division went to Keeleigh McCauley (Helensburgh-Stanwell Park) and Andras Eglesz (Newport). “Congratulations to Newport for taking out the club point-score. We’ve had a great three days of competition here at Ocean Beach-Umina who have once again been wonderful hosts,” NSW Surf Life Saving Sports Manager Shane Knight said following the championships. 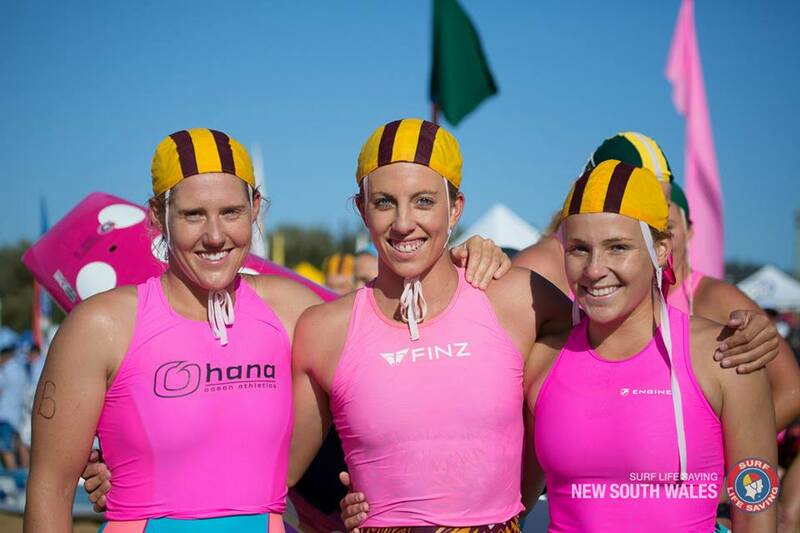 Manly powered ahead of fierce rivals Newport and Wanda in the club point-score on a pulsating second day of competition at the 2015 NSW Surf Life Saving Open Championships. Umina and Ocean Beaches turned on a sparkling warm autumn day with light onshore breezes, plenty of sunshine and manageable surf conditions. Toned and tanned arms swam and paddled furiously out through the surf to the turning cans for team finals and individual qualifiers on day two of the water events. Helensburgh-Stanwell Park lived up to its reputation as a beach sprinting powerhouse with a number of sensational performances by their athletes. In fact, the women’s open final had four representatives from the club in what was easily one of the best sprinting fields of the competition. Elly Graf (Elouera) took out the field ahead of the Helensburgh-Stanwell Park (HSP) duo of Yvette Avery and Siobhan Dibley. It was a big afternoon for Avery who also gold-medalled in a dead heat in the U17s beach sprint and the U19 beach relay. “I’m very happy to get the win in what was a really competitive field. I haven’t been on the beach for a while so it’s great to get back into it,” Graff said after the race. “I knew I had to get a good start and once I got that the plan was just to maintain and really capitalise on my speed throughout the race, but it wasn’t until the last couple of metres that I thought I would win. “It was a very good track. I prefer the sand to be a little harder as it’s similar to an athletics track,” she said. It was a win for the home branch in the U19s female beach sprint when Bianca Mould (Avoca Beach) held off Kaitlin Mott (HSP), and Renee Stortenbeker (Elouera). “It was really fun to run out there today; they were almost perfect conditions. It wasn’t too hot and being slightly overcast actually helped a bit,” a delighted Mould said. Judges couldn’t split Yvette Avery (HSP) and Sophie McGovern (North Curl Curl) in the U17s with Kate Lewis (HSP) picking up the bronze. Both athletes were philosophical after the race, but each were adamant the other had won. “We’re very familiar with each other’s style having raced against each other for a long time,” McGovern said. “I’m just enjoying racing on such a nice track, and now I can focus on getting in some extra training for the Aussies,” Avery added. In the U15s Cronulla’s Phoebe La Coste timed her run to the line perfectly, claiming her first medal at a state level ahead of Ashley Dunford (Collaroy) and Lilly Bennett (Narooma). “It’s the first time I’ve won any medal so I’m really happy,” she said. La Coste also praised the track saying the consistency of the sand made it enjoyable to run on. In the male events, Lawson Christiansen from Caves Beach in the U15 boys sprint took home his first state gold and Collaroy’s Dean Scarff lit up the ClubsNSW Arena when he turned last year’s silver medal into gold at Umina Beach in the Open men’s sprint. While Daniel McKellar (U19s) and Timothy Burgmann (U17s), both of Helensburgh-Stanwell Park, added to the impressive state championship medal tally for the Illawarra club. In the water team relay highlights included Georgia Miller and Lara Moses (Newport) combining to win the open female board rescue ahead of Elouera and Cronulla, while Cameron Coghlan and Nathan Smith (Manly) held off strong challenges from Elouera and Newport in the male event. The 2015 NSW Surf Life Saving Open Championships proudly supported by ClubsNSW will conclude on Sunday 15 March. 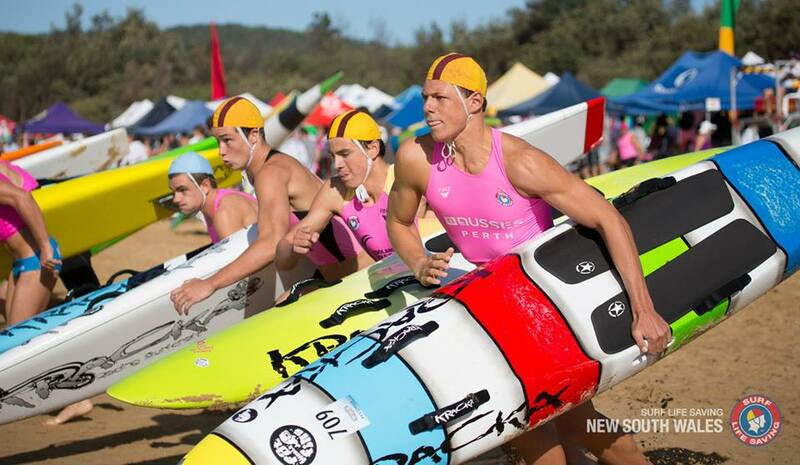 Manly’s dominance in the water delivered the strong Sydney northern beaches club the lead over fierce rivals Newport after the opening day of the 2015 NSW Surf Life Saving Open Championships at Ocean-Beach Umina played out. Gusty onshore sou’east breezes brought cool 20kt winds and showers across the open ocean to the water competition areas and those on the beach spectating plus shivering athletes huddled under tents waiting for their next event to marshall. Towards the latter part of the afternoon the breeze and swell backed right off for the last of the water events, making conditions more comfortable for runners in the final event of the day, the 2km beach run. With twilight looming competitors on the sand were keen to show their wares in the endurance event. Sydney club Wanda enjoyed the most success, clean-sweepingthe U15 Female Race thanks to top performances by runners Lara Saunders, Chloe Gentle and Elly O’Donaghue. Other club mates who enjoyed success were Emily Rohr (U19s) and Emma Brown who won silver in the U17s behind Queenscliff’s Elly Anne Slennett. In the U19 Male Race, Bungan’s Jack Brown and Michael Nicholas claimed the gold and bronze medal respectively with Manly’s Angus Pryde finishing with the silver. Lachlan Heuston (Redhead) finished ahead of Christopher Breen (Cronulla) and Tom Lewis (Wauchope- Bonny Hills) in a highly competitive U15 Race. A number of water finals were contested on the opening day of competition. Emily Rosskelly (Warilla Barrack Point) took out the U17 Female tube ahead of Rachel Wood (Umina) and Jacqueline Schafer (Queenscliff), while it was 1-2 double for Newport in the U19 Male Surf Race as Jayke Rees edged out Ollie Signorini and Elouera’s Lachlan Galea. In a tough fought U15 Male Tube, Ryan Carroll (Tacking Point) claimed the gold ahead of Nick Hards (North Cronulla) and Manly’s Tom Doyle. It was a successful day for Central Coast clubs, hosts Umina finishing fourth in the overall point-score. Avoca’s Keely Booth won gold in the U15 Female Tube Race, while club mates Nicholas Duell-Ferguson and Beau Jeffries took out the U17 Male Board Rescue. Umina’s U19 Rescue Tube Rescue Team also enjoyed the spoils of success on day one of competition. Some of the bigger names in the sport kicked off their three-day program in the Open Surf Belt event. Ironman Kendrick Louis (Newport) won the Open Male title ahead of Terrigal’s Tim Schofield, while in the women’s contest Jessica Collins (Redhead) finished ahead of Newport’s Georgia Miller. The 2015 NSW Surf Life Saving Open Championships proudly supported by ClubsNSW continues tomorrow Saturday 14 March. Reports by Surf Life Saving NSW - Photos by Jamie Nilsson – SLS NSW.